Q: What exactly is high performance nutrition? A: High performance nutrition is a way of eating that enables your body to be more efficient from a metabolic standpoint. This means your body is trained to utilize it’s fat stores for energy instead of having to rely on it’s limited glycogen stores. Q: How much does my daily diet really impact my race performance? A: Much more than many athletes consider. Just as your train your body physically for race day, you must train it metabolically. When you implement high performance eating daily, you will have trained your metabolism in a way that you will be able to perform at higher intensities with less calories, it will significantly diminish or eliminate GI issues, and makes desired strength to weight ratios more easily attained. Q: Will this way of eating impact my training? 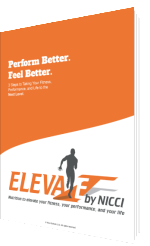 A: High performance eating allows you to build and keep muscle more efficiently and have faster recovery. You get more benefits from your physical training, which translates to being even faster on race day, who doesn’t want that! A: Just like anything else, you get out what you put into it. You can start seeing results in a matter of weeks. However, it can take up to two years for your body to fully adapt to this way of eating, so the more committed you are the more success you will have. Q: Is high performance eating restrictive? A: Everyone has a different starting point in this process, so the program is varied depending on that point. You can choose to be more aggressive if you want more results more quickly. When you adopt this methodology you allow your body to get back in touch with its natural hunger and full responses, which will generally make want to eat less. However, there are no food group restrictions and no calorie counting. Q: What if I’m not an athlete, and I just want to lose some weight? A: This eating format is ideal for anyone, especially someone who wants to get their health and weight under control. The foundations of high performance eating create ideal health. This is precisely what allows the body to shed fat and weight and allows athletes to perform at their absolute best.